Here is my latest paper on chaos and complexity. It is available for download as a PDF. Recent reports by IBM and KPMG both show that while CEOs recognise complexity as their greatest challenge, they do not know how to cope or manage it. For a small number of companies, embracing complexity provides them with a competitive edge in terms of responsiveness, information management, creativity, innovation, and human resources. A number of decision-making frameworks exist in Complexity Management, but these are often not understood or have only limited applications. In order to really gain an understanding of the deep insights of chaos and complexity theory, managers are required to undergo a transformation of consciousness, away from their mental models and assumptions about the world based on Newtonian, Cartesian and Darwinian thinking. This is not easy, and unless the teaching of complexity theory is accompanied by a thorough grounding in perception, thinking and dialogue, managers run the risk of confusion and not understanding how to really benefit from the insights, implement new business models, and take a quantum leap in creativity and innovation. Although not widely used or understood, methodologies do exist to help people make this journey, and following in the footsteps of VISA, a number of new companies at the cutting edge of chaos theory are forging their way to the new frontiers of both business and science. The world is at a turning point, and it is now time for many more businesses and organisations to make this transition. Today’s complexity is only expected to rise, and more than half of CEOs doubt their ability to manage it. Creativity is the most important leadership quality, according to CEOs. The most successful organizations co-create products and services with customers, and integrate customers into core processes. Better performers manage complexity on behalf of their organizations, customers and partners. In many ways this is not a surprising observation. We have moved from the industrial age to the information age, and much of the complexity arises from the greater involvement of people in business processes, as opposed to pure manufacturing. One very successful complexity management tool is the Cynefin framework developed by David Snowden and Mary Boone. This framework enables business leaders to better understand the context of the problems that they are attempting to manage and solve. Probably the greatest insight that the framework offers is to highlight how different leadership styles are required for different situations. This may sound tenuous, but as Snowdon and Boone point out, most business leaders have been taught “command and control” methodologies based on the assumption that the world is ordered. However, when leaders face complex or chaotic situations, they must rely on their natural capabilities and will often be called upon to act against their instincts. When one examines chaos and complexity from the Cynefin perspective, it becomes apparent that business leaders need new ways of thinking and acting, and new tools and methodologies. But what exactly is this new way of thinking and acting, and where will the inspiration for the new tools and methodologies come from? While the Cynefin framework is certainly useful as a tool for discussing the many different types of problem scenarios faced in business, I have noticed that while it begins to introduce the concepts from scientific chaos and complexity theory into the business world, many confusions can arise, and business students can be left even more perplexed than previously. There are two main reasons for this. 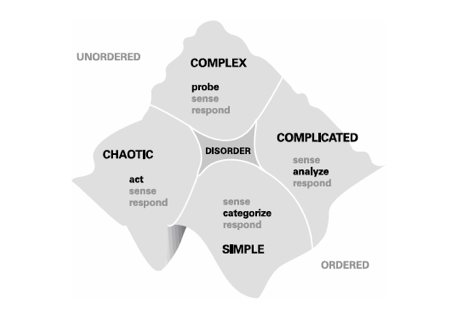 The first reason is that the Cynefin framework uses the words “complex” and “chaos” as they are commonly understood in informal language, and this can be seen by their relatedness in the framework to the “unordered” domain. In chaos and complexity theory, simple systems can display not only complex behaviour, but chaotic behaviour too. When a system is functioning at a far-from-equilibrium state, this dynamical behaviour “on the edge of chaos” at a microscopic level can actually manifest itself as an ordered system at a macro level. The second reason for students struggling to understand the Cynefin framework is that it calls for new ways of thinking and acting from business leaders. For me this really brings to mind the famous quote from Einstein. “No problem can be solved from the same level of consciousness that created it.” This famous quote is often stated but rarely understood at a very deep or profound level. Before we can really gain any level of insight from understanding chaotic and complex systems as are found in nature, we first have understand the limitations, and perhaps faulty metaphors and mental models in our own way of thinking. If teachers of chaos and complexity do not first take students through this particular learning journey, then the can not be possibly expected to be able to gain a deep insight from complex systems that can take practitioners in this domain many years to acquire. It is perhaps symptomatic of just how hard it is to reach a higher level of consciousness to solve business problems from a deep understanding of chaos and complexity that so few case studies are quoted in management literature. However, there is one example that stands head and shoulders above the rest, and that is the birth of VISA. In 1968, the nascent credit card industry was in turmoil, and on the brink of self-destruction. A 38-year-old Dee Hock, then a vice president of a licensee bank of the BankAmericard system was chosen to head up a committee of licensees to find a systematic solution to their problems. Hock was given a clean slate to develop his ideas explicitly based upon biological concepts and metaphors that he had been avidly studying. This would allow the new system to evolve, invent and organise itself, the only solution for coping with complexity on such a huge scale. In 1970, after two years of “brainstorming, planning, arguing, and consensus building” the new VISA system was launched, with Hock as the CEO. VISA was a nonstock, for-profit membership corporation with ownership in the form of nontransferable rights of participation, highly decentralized and highly collaborative. At its heart is a creative tension, members are both competitors and collaborators at the same time. While members compete fiercely for customers, at the same time the system works because participating merchants must be able to accept the cards from customers of their competitors. 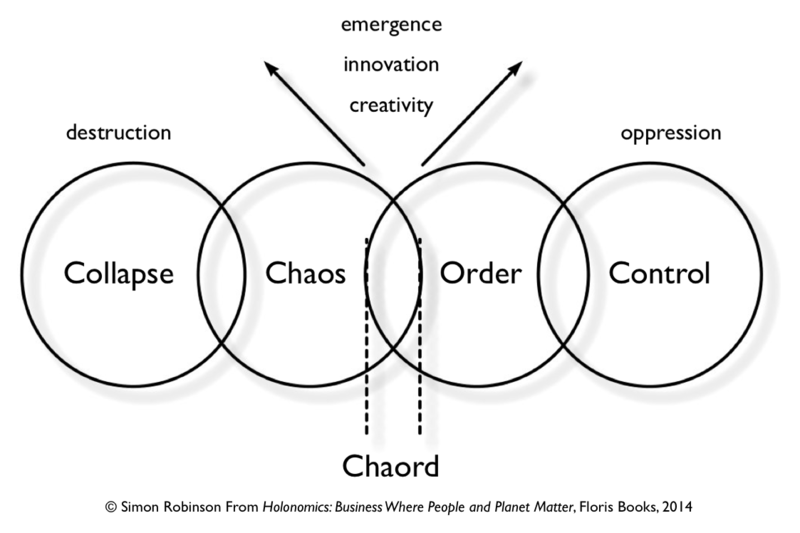 By chaord, I mean any self-organizing, self governing, adaptive, nonlinear, complex organism, organization, community or system, whether physical, biological or social, the behavior of which harmoniously blends characteristics of both chaos and order. Loosely translated to business, it can be thought of as an organization that harmoniously blends characteristics of competition and cooperation; or from the perspective of education, an organization that seamlessly blends theoretical and experiential learning. As I learned from the formation and operation of Visa, an early archetype of such organizations, they require a much different consciousness about the leader/follower dichotomy. This concept is shown in figure 2, where it is the intersection of “chaos” and “order”. We now have two very different models of chaos, complexity and order, both taking their influence from complexity theory in science. In order to help students really appreciate these models, and how complexity and systems thinking can be utilised in a business environment, I show them many different natural systems, and ask what insights we can gain from these. But before I do so, I do what many teachers and business thinkers do not. I take students through a learning journey, one in which the history of science is explored. I shall now explain why. The world of systems theory is full of strange and technical concepts such as fractals, bifurcations, non-linear dynamical equations, and emergent properties. When understanding systems, the traditional scientific approach of reductionism, reducing a phenomena to its constituent parts simply does not work. This is because natural systems are neither mechanical not computational devices. Mechanical and computational metaphors break down when understanding nature, for nature consists of living systems which are capable of self-reproduction, and demonstrate behaviours that still defy scientific understanding, be it human vision, morphogenesis, the social behaviour of ants, the problem-solving intelligence of slime-mould and the construction abilities of termites. There is a reason why business students often fail to get to grips with complexity theory and that is because their mental models and assumptions about the world and universe are based on classical Newtonian physics, the scientific methodologies of Descartes and Bacon, and a biological knowledge informed by Darwin. While science has embraced non-linearity, stochastic modeling and systems thinking, the same can not be said of business, with its fixation on command-and-control methodologies and linear thinking. However, inspiration from science is a double-edged sword. For while new innovations in scientific thinking can lead to more inspired business thinking, creativity and innovation, the scientific methodology contains many traps. 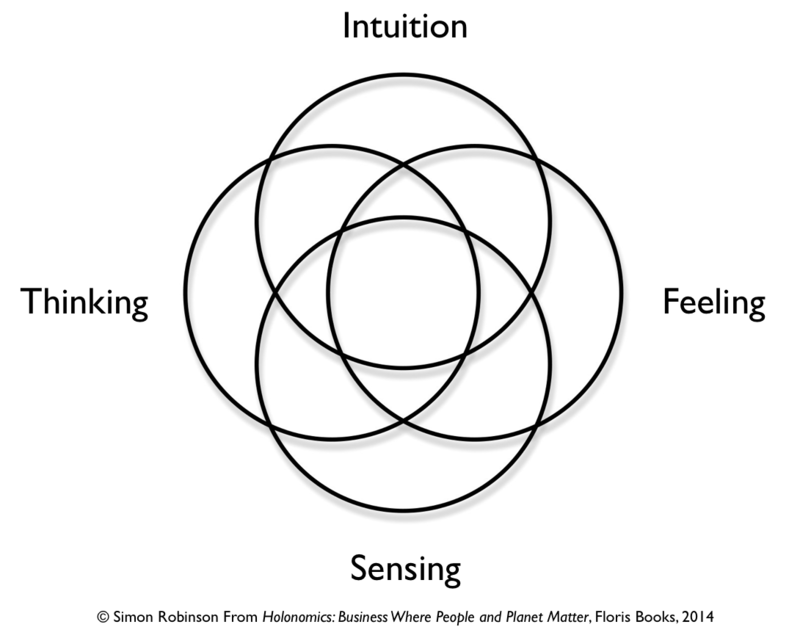 In order to understand these traps, I utilise Jung’s framework of knowing the world to demonstrate the different types of knowing, and what the different is between “thinking” (our ability for intellectual and conceptual thinking, our ability for the abstract manipulation of symbols) and “sensing”, “feeling” and “intuition”. The scientific world says nothing about, and indeed derides these other ways of knowing. By taking students through many examples of scientific discoveries, and also by using a number of practical exercises, we find that in fact science does not progress through a systematic series of logical steps that arise from an analysis of “facts” derived from unfiltered observations of an objective world that exists independently of the observer. Scientific discoveries are actually new perceptions of meaning, and they come through the scientist’s intuitive faculties. In order to be able to perceive objects, we first have to have an idea of the object before it can be “seen” or perhaps “known”. Science is therefore a creative activity, with the mental models and metaphors of the scientist informing them of how to conceive and interpret the results of their experiments. There are many examples of this to demonstrate the point, from the nested spheres of the universe of Ptolemy, the trajectories of Albert of Saxony, the influence of the economic theory of Adam Smith on Darwin, the many different interpretations of quantum physics, and the failed predictions of the Human Genome project that humans would have many more genomes than less complex animals. In his treatise on colour, Goethe paved the way for a complementary scientific protocol, one which sought to avoid the traps of being caught in a thinking mode, and one which sought to understand a system first by staying in the sensory mode, which could then lead directly to a deep insight and an ability to have an encounter with wholeness through one’s insight, and not via one’s abstract intellectual mind. While this paper is only touching very briefly on what are quite profound subjects, ones which can quite amaze students who have never been taught how to think about their thinking process, the point I often make is that creativity and insight come from moving from one of the extreme points in Jung’s “mandala” to the centre, where we are better able to make use of all the modalities of knowing, and not just reliant on one. This is by no means an easy path, but complex systems can not be understood by the intellectual mind alone, and so it is certainly a path well worth taking, since we are now living in a knowledge economy, albeit a knowledge economy biased so far towards western Newtonian and Cartesian mindsets that no longer serve us in our complex, chaotic and interconnected world. Attempting to understand natural systems is a great challenge, since there are many systems in nature that we do not understand. We do not understand human or plant cells, and our computational metaphors to explain DNA are now known to be too limited to understand the relationship between DNA, genomes, proteins and morphology, the process of becoming, being, and growth that all organisms go through, from a minuscule number of undifferentiated cells to their adult forms in all their complexity. The reason for this breakdown is that it is not possible to reduce organic systems down to their parts, since in losing sight of the whole system, you lose the complex interactions between the parts and their environment. In analysing complex systems, we have to move away from this reductionist approach to one that understands the dynamic relationship between the parts. Once we take this perspective, we can then begin to understand how scientists have discovered startling similarities between disparate systems such as chemical clocks, slime mould, the human heart, neurons in the brain, and social insects. We are also then able to understand, or begin to appreciate how chaotic behaviour at the micro level of a system can lead to the emergence of ordered behaviour at the macro level. Hence chaos and complexity are not now seen as disturbing influences to be managed, controlled and simplified, but as vital aspects of systems which are resilient, self-organising and creative. And once we understand these principles of complex systems, we can then better appreciate how many innovations in the business world are actually taking design cues from the natural world, since nature has already solved many problems that we find so difficult in our human “thinking” or “intellectual” world to solve. In my experience I have found that business students of chaos and complexity theory are left in a state of either not understanding the theory at all, or not understanding its relevance to business. Chaos and complexity theory although having their roots in the new theories of thermodynamics of the 1800s, only really started to gain traction when computational power allowed scientists to really explore in detail non-linear mathematical models. Also, if chaos and complexity theory is taught just from the thinking perspective, then many insights that can only be gained from deep sensory immersion and from the intuitive way of knowing will also be lost. And motivation to act on the insights will also not manifest if a deep embedding into a complex system is not felt. Another advantage of studying the history of science is to understand the role that dialogue, true dialogue, plays in communication. More often than not in business, conversations are nothing more than an arena for arguments, and the imposition of one world view over another. In true dialogue, such as that espoused by the late David Bohm, true dialogue can only take place when we put as much effort into understand another’s worldview as we do attempting to impose our own. Dialogue can then be seen as an exploration of meaning, rather than warfare and competition. Many new methodologies such as Open Space and World Cafe are excellent at developing new forms of conversation in organisations, but what is missing is an emphasis of understanding the limitations of thinking in order to open up true creativity. The study of systems teaches us that the primary focus should be in understanding the relationship between the parts of a system, and not the individual parts themselves. Thus dialogue should also be an opportunity for exploring new forms of organisation, in order to create true learning organisations, and not ones where learning and creativity is limited by the imposition of out-of-date models and metaphors. We started this analysis by looking at how organisations can come to first understand, and then exploit complexity as a form of competitive advantage in the knowledge economy. Chaos and complexity theory are not taught in schools or universities, and we have seen how Newtonian physics and the biology of Darwin are still to this day the prominent theories that shape our worldview. I am not saying that either of these two theories have no value, far from it. But their limitations have to be acknowledged, so that new domains can be explored which require a deeper understanding of natural systems, at the ecological, biological, chemical, physical, and quantum levels. Businesses can exploit complexity theory by being inspired to create new business models, new forms of organisation better able to react and adapt, and new products based on biomimicry, natural function and form. This new learning will not be easy, since it involves a deep learning journey away from the reliance on thinking, to a more rounded way of knowing and being in the world. Methodologies exist to help people make this journey, and following in the footsteps of VISA, a number of new companies at the cutting edge of chaos theory are forging their way to the new frontiers of both business and science. The world is at a turning point, and it is now time for many more businesses and organisations to make this transition. Would you agree that the current #occupywallstreet is actually an exercise in applied system theory in the social space? In fact, the movement set itself a goal to come up with the one demand they want to pronounce. But instead of conventional approaches, they are holding people assemblies and having conversations on what that demand should be. That to me sounds like working towards an emergence of the final outcome…? Good question and I am actually going to be discussing Occupy Wall Street next week in a class. You can also compare this movement to the UK riots which started in London in August. In the instance of the riots, that for me was an instance of human values breaking down, and behaviour motivated by a lack of people’s self worth or intrinsic value. The kids were simply trying to grab as many consumer items as they could. But Occupy Wall Street has some excellent decentralised organisational principles, as well as also coming from a level of consciousness that well understands exactly what the cause of our economic problems are (as opposed to believing the daily propaganda put out by the industrial-military complex). It really is a very exciting emergent movement, and so long as they are able to battle the very dirty tactics of those they are fighting against (extreme media propaganda, agent provocateurs within the movement etc), then this could really be the start of the US finally waking up and dealing with their own stuff in their own backyard, as opposed to their normal mode of invading countries and stealing their resources.